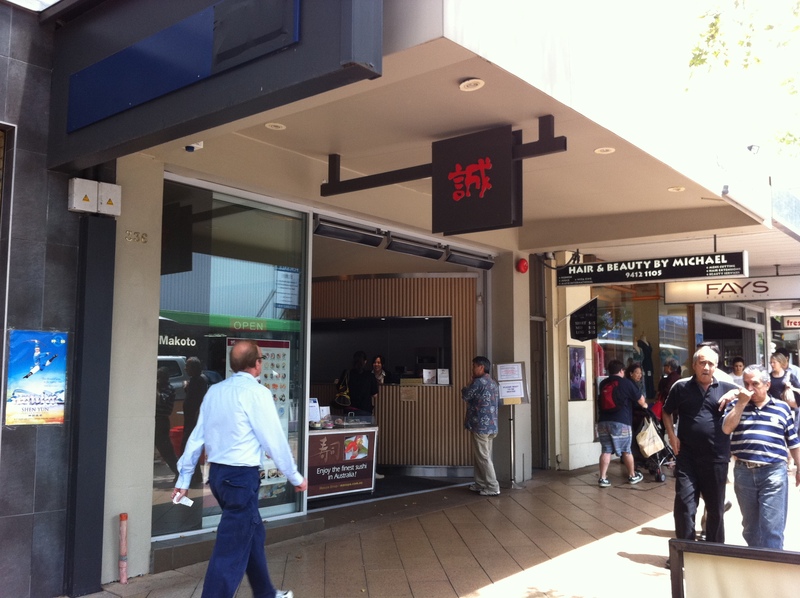 I walk past the Makoto sushi train in Chatswood on a regular basis and there is often a queue outside. I had also heard from a work colleague that it was the best sushi train in Chatswood and so I decided to go and try it out. On this day there wasn’t a queue out the door and I was seated immediately. Somehow they forgot to come over to take my drinks order, however I didn’t want to order a drink so it didn’t bother me. 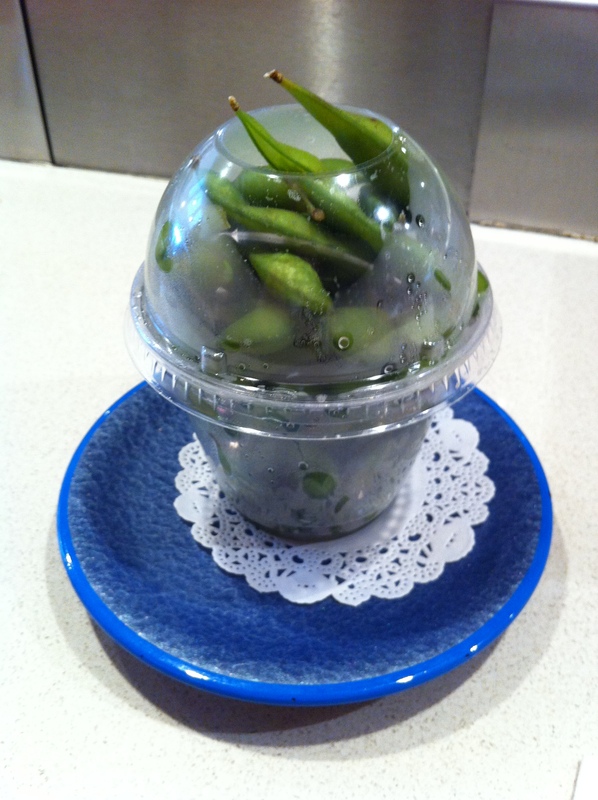 I started off with some edamame which were perfectly salted and a good sized portion. 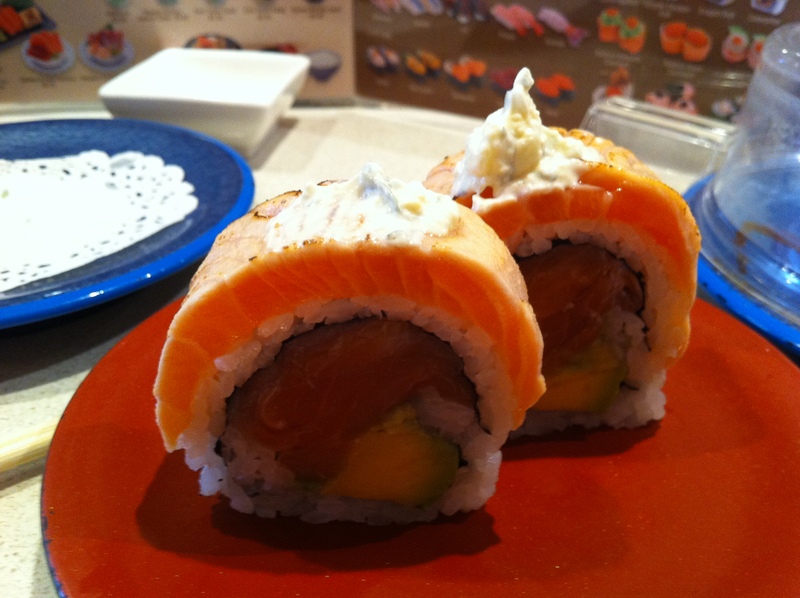 I then choose a range of sushi rolls, firstly a salmon and avocado roll which is my favourite at any sushi place. However this one had a twist, it had a piece of salmon around the edge which had been slightly cooked using a blow torch. This gave it a great twist and I would definitely recommend it. I don’t usually go for the cooked tuna and avocado roll however Makoto’s one looked highly appealing with the toasted seeds on the outside so I gave it a go and I am glad I did! It was fresh and the warm toasted sesame seeds on the outside gave it a great texture. Being my favourite I decided to try another type of salmon and avocado sushi. This one had avocado, cucumber, capsicum and a piece of white fish (I am not sure what type). The sushi also had a spicy dukkah type mixture on the outside and there was a swirl of sweet chilli sauce on the plate. 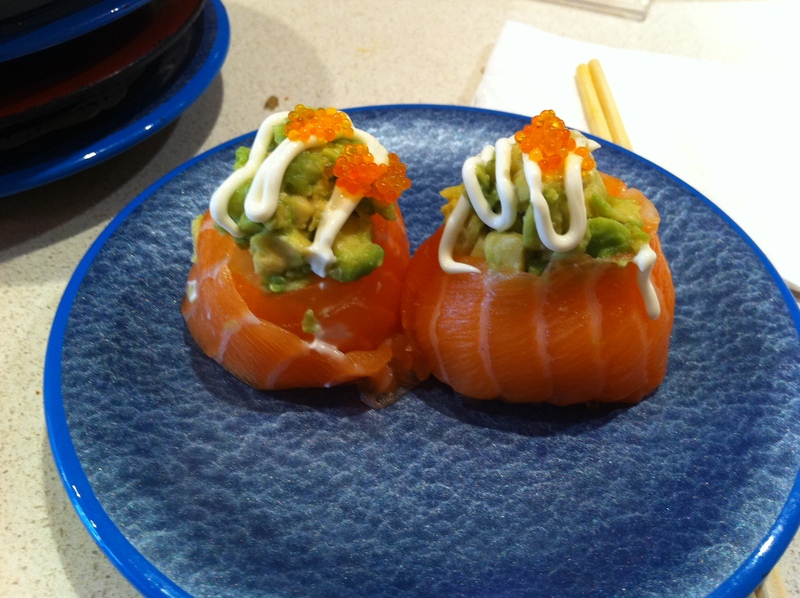 This was also a great variation on salmon and avocado sushi and I highly enjoyed it. The final salmon and avocado sushi I had didn’t have seaweed but the rice was wrapped in salmon and on top of the parcels was avocado, mayonnaise and fish roe. This was nice but not my favourite. Finally, I noticed eggplant sushi on the menu but hadn’t seen any on the train. I asked one of the waitresses and she said that you have to order it and it would take about 15 minutes. I wasn’t in a rush and was very keen to try this one so I decided to go for it. 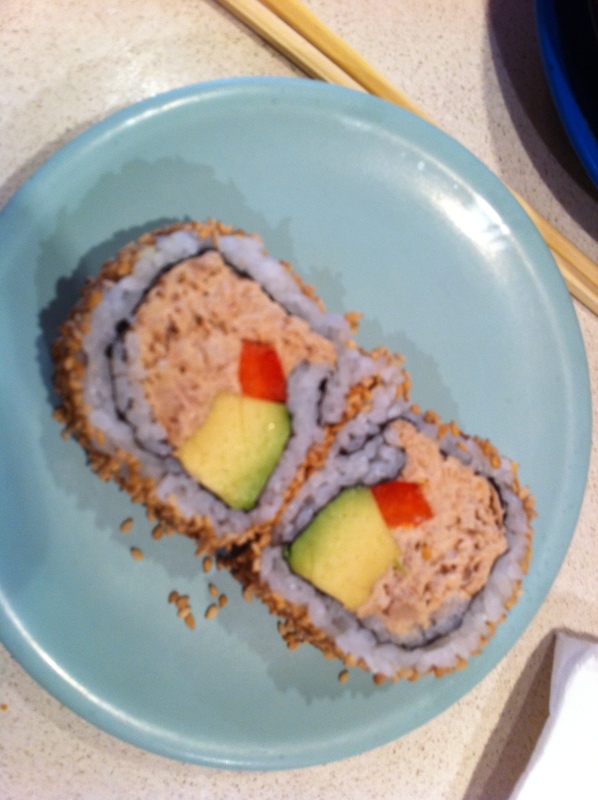 This was my favourite sushi of them all. The eggplant around the outside was warm and tender. The sun dried tomatoes in the inside reminded me of my favourite sushi at Cafe Wasabi (an Japanese place in St Leonards), the avocado and sun dried tomato sushi roll. 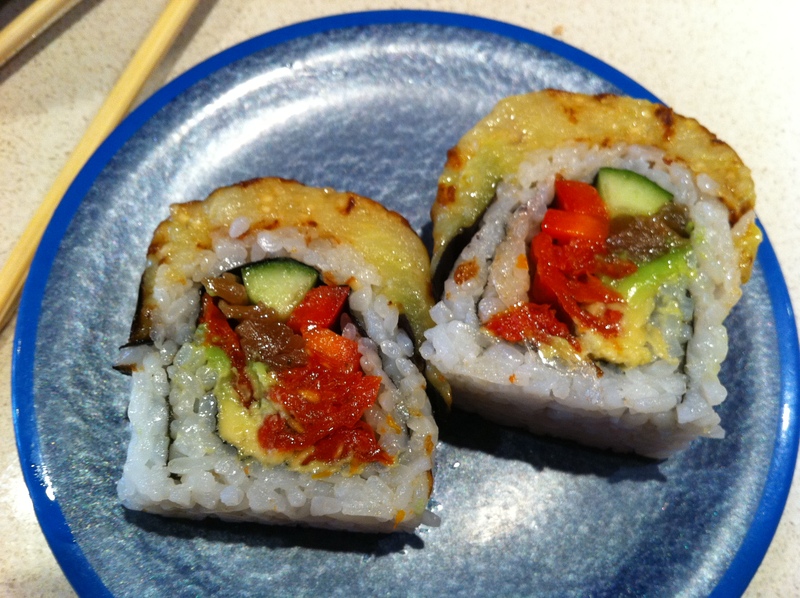 The sushi also had some more eggplant in the inside, as well as avocado, cucumber and capsicum. 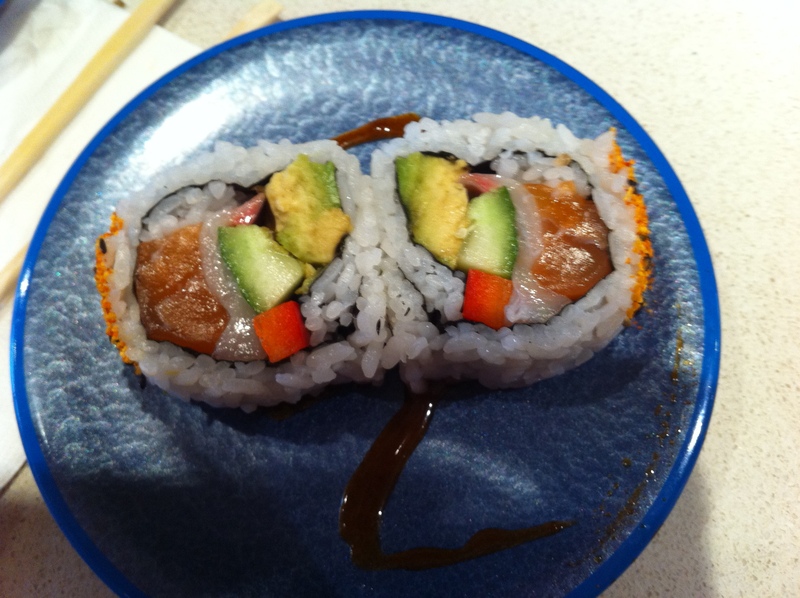 Yumm… that Sushi looks so good! I good Sushi place is worth it’s weight in gold. 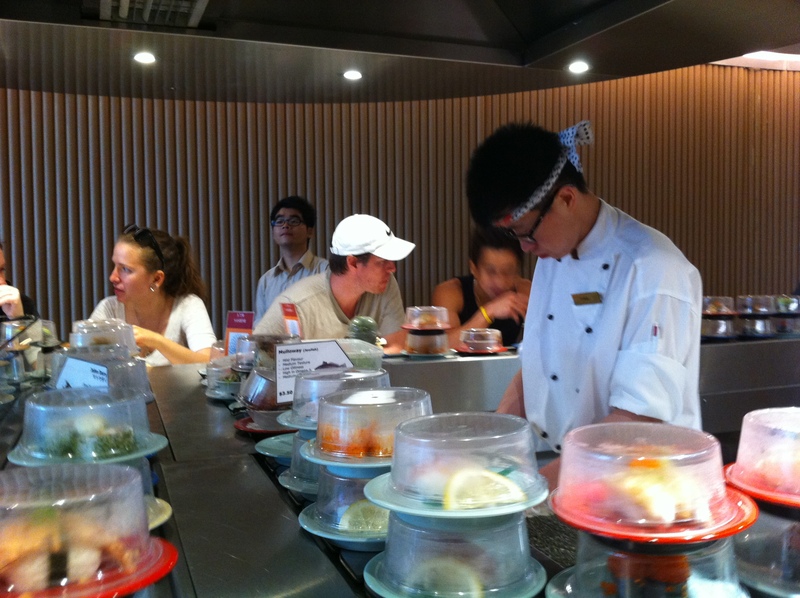 Although it’s very over priced and there’s always a long wait, the sushi is worth it. It’s new competitor down the street might be stealing my heart away though.